Wine is one of the most popular drinks in the world. Obtained from the fermentation of the must, this delicious beverage is quite easy to make at home. If you want to give it a try, know that on the market there are many wine making kits designed to make the process easier. If you already know how to choose one, go directly to our selection of the best wine making kits using the links in the table below. Why Should You Invest In A Wine Making Kit? Making ﻿﻿wine at home is less complicated than it sounds. On the market, it is easy to find all the necessary equipment and some manufacturers even sell wine making kits that provide all the supplies needed throughout the process. But do you really need a wine making kit? And if yes, how should you choose one? Let’s see why you need a wine making kit if you decide to produce your own beverage and how to choose the one that suits your needs. 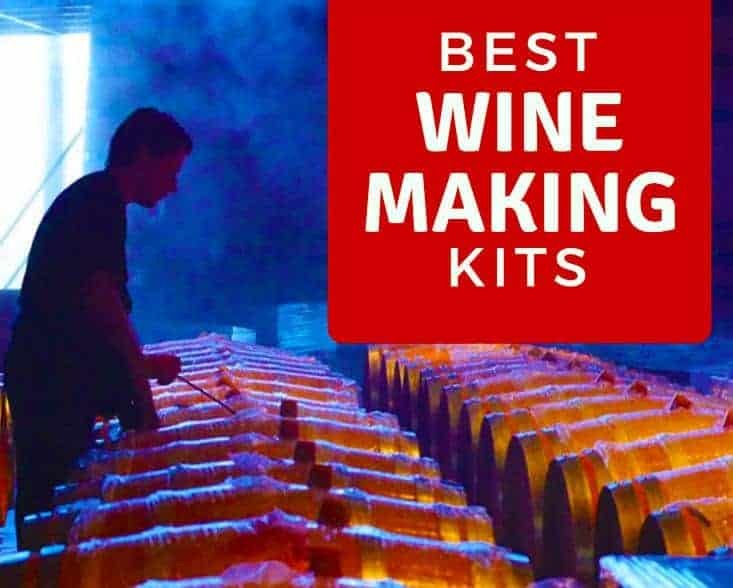 At the end, make sure to check our best wine making kits selection, maybe you will find the right one. When approaching winemaking for the first time, most people are confused about the equipment needed to produce the beverage. If buying quality grapes is obvious, the fact that you need a bucket, demijohn, stirrer and other equipment is not so intuitive. If you already made your first wine at home, you probably found out that there is a lot of equipment needed for the winemaking process. And if you didn’t use a wine making kit, you probably also know what a hassle it is finding all the different containers and accessories. Moreover, for winemaking, you’ll need more than just the equipment. You will also need wine yeast, pectic enzyme, and a number of other ingredients apart from the wine. Now, how would you feel about investing in a kit that provides all the necessary materials with the exception of the grapes? Wouldn’t it be wonderful? If your answer is yes, then you already know why you should invest in a wine making kit. Otherwise, just consider the advantages of this winemaking option to understand the importance of having one or more wine making kits in your house. If you’re now convinced that a winemaking kit is right for you and are ready to head to the closest local store to search for one, stop! On the market, there are two different types of wine making kits and you should decide which one is the right one for you before hitting the road. To decide what type of kit you need, you should first decide if you want to start your wine from grapes (truly recommended) or from grape concentrate or juice. In the first case, you should invest in a winemaking kit that only comes with the necessary equipment and maybe with a few ingredients such as yeast, pectic enzyme, nutrients, and other ingredients. There is to say that you could even start your wine from grapes alone and let nature do the rest, yet the winemaking process might be shorter and smoother if you help the fermentation process. In the second case, you should know that on the market there is also available a series of wine making kits that give you all the ingredients needed to make the type of wine you like best, including the grape concentrate or juice. These kits also come with a booklet of wine recipes and instructions, yet the flavor and aromas of your beverage might be of poorer quality compared to the homemade wine started from grapes. The choice of one kit over the other is a pure question of preferences. As true wine lovers, we recommend starting your wine from grapes. The process is not as complicated as it may seem and the organoleptic characteristics of your wine will be superior to those of a wine made from concentrate. If this is the first time you make your own wine at home, below are illustrated the main steps of winemaking from fruit. Making wine from grapes is a simple and straightforward process. However, there are a few important steps you should follow to ensure the success of your attempt. Sterilize the equipment: winemaking requires the use of various containers and tools, such as steel or plastic bins, demijohns, stirrers, and more. To ensure the success of the winemaking process, you should make sure that all the equipment is perfectly clean and sterilized before putting your grapes in them. For cleaning, avoid using perfumed detersives. Choose the right place: the winemaking process should be carried out in a cool cellar or room. High temperatures can compromise the quality of the wine. The place you choose should also be well ventilated. During the fermentation, wine releases carbon dioxide, a gas potentially harmful when inhaled in large quantities. Use freshly harvested grapes: freshly harvested grapes are usually more juicy, resulting in more wine. Crush the grapes according to the traditional method, with your feet or hands, then get rid of the rasps as their presence in must will increase the acidity of the wine and also the level of tannins. Even if winemaking is fairly easy, we know that approaching it for the first time might be rather confusing. Therefore, the North Mountain Supply 1 Gallon Wine From Fruit Complete 30pc Kit might be the right kit for the winemaker in you. This kit contains 30 pieces and includes everything you need to make the wine, with the exception of the grapes and bottles. Moreover, the kit also includes a handy recipe booklet that also contains step by step instructions on how to use the North Mountain Supply kit. The kit is perfect for newbies and experienced amateur winemakers and comes with three packs of multi purpose yeast suitable for both white and red wines. 30 pieces: the kit literally contains everything you need to make wine at home, including a 2-gallon fermenter bin, a glass jug, siphon, and more. Caps and bottle filler: the wine making kit doesn’t come with the bottles, yet it comes with the caps adding, even more, convenience to the package. Instructions: the instruction booklet is extremely detailed and represents a perfect step by step guide on how to use the kit. Corker: there are only a few wine making kits that come with a corker, and this is one of them. The kit doesn’t include the bottles. While it is hard to appreciate how many bottles might serve, at least five or ten bottles would have been a nice addition. If you never made wine at home before, then you might like this complete and easy to use wine making kit. The kit contains everything you need to make wine from any fruit you desire. In fact, even if the wine is essentially made from grapes, there are many wine recipes that use other fruits as the main ingredient. 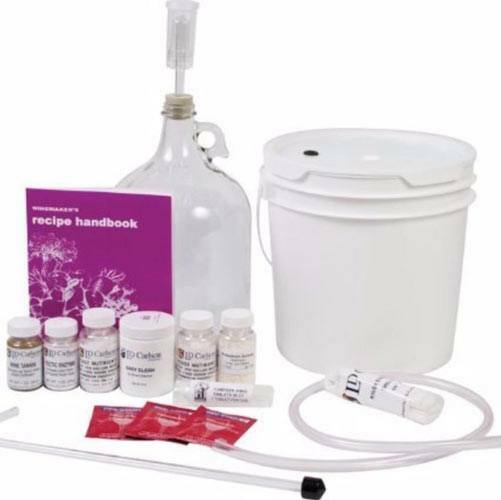 This kit, in particular, comes with a useful booklet containing 101 one-gallon fruit wine recipes which are perfect to make your own small batch wine varieties. The kit also includes all the necessary equipment and additives, including high-quality yeast and yeast nutrient. The only thing not included in the kit are the corks, a corker, and the bottles. While these would have been a nice addition, we like the fact that you don’t have to pay for standard wine bottles when you might like to bottle your beverage in larger bottles. 1-gallon kit: for the beginners, starting their first batch with a 1-gallon kit is the ideal, as you will not waste a lot of fruit and ingredients if things go wrong. Suitable for all types of wine: you can use grapes or any other type of fruit to produce your delicious homemade beverage. High-quality yeast: the yeast included in the kit is ideal for red and white wines, as well as for wines made from other types of fruits. Recipe booklet: when approaching winemaking for the first time, it is hard to determine how much fruit you need to use with a specific kit. This booklet gives you 101 choices to make the wine that most appeals to you. It seems that the kit doesn’t come with an instruction booklet. If you are already confident in making your own wine at home but would like to invest in a kit that can make your life easier, then the Deluxe Wine Making Kit might be the right one for you. 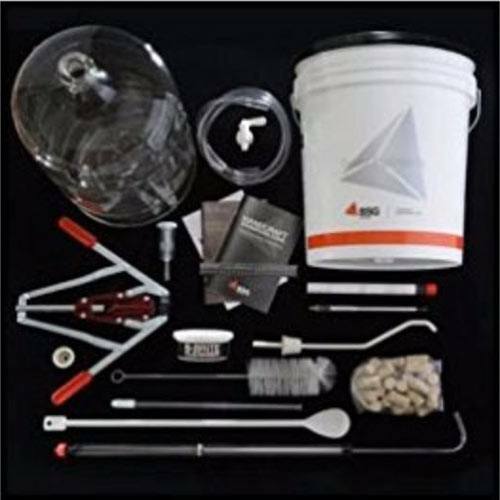 The kit is suitable for making 6 gallons of wine and it includes all the necessary equipment for making wine and also all cleaning equipment needed for the cleaning and sterilization of the different components. Although it includes the corks and a corker, the kit doesn’t come with wine additives and yeast. For this reason, this wine making kit is great for the most experienced amateur winemakers but the beginners might find it difficult to use it. Nevertheless, the kit includes both an instruction booklet and recipes. So, if you’re an ambitious first-time winemaker, you can still give it a go. Cleaning equipment: a thing most wine kits don’t include is the cleaning equipment such as bottle brush and cleanser. Yet, this kit comes completed with all the equipment you need. 6-gallon capacity: if you have a numerous family or plan on giving some bottles to your friends and want to produce more wine, this kit has a perfect capacity. Long-lasting: the kit is guaranteed to last for years before any of the parts, except for the corks, will need replacing. Easy to use: thanks to the thorough instructions, using this kit is a breeze. Although the kit is deluxe, some of the electronic components, such as the thermometer, don’t seem to be durable enough. Master Vintner Fresh Harvest Fruit Winemaking Kit is excellent for both beginners and experimented wine makers, and it comes with almost all the supplies needed to make 15 wine batches of one gallon each. The kit is also ideal to make wine for any type of fruit, not necessarily from grapes. To inspire you, the kit is supplied with a useful recipe handbook. Although of an excellent overall quality, the kit lacks a few important elements. Among them, the corker and corks, not to mention the bottles. Nevertheless, all these supplies are easy to find on the market, so this isn’t a major inconvenience. A thing we really like is the high-quality multi-purpose yeast that is suitable for all types of wines. Perfect for beginners: the kit is ideal for beginners, as it includes all the necessary supplies except for the fruit, bottles, cork, and corker. 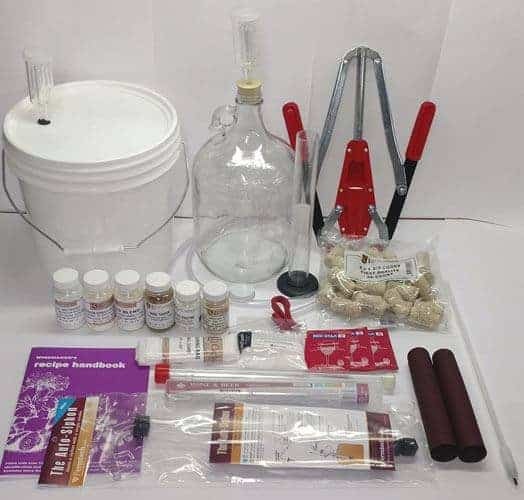 1-gallon capacity: designed to make small batches of wine, this kit has a one-gallon capacity allowing you to test and try all the desired recipes without requiring many ingredients. Detailed instructions: the kit comes with an instruction booklet which is very detailed and useful in helping all aspirant winemakers succeed in making delicious wine. 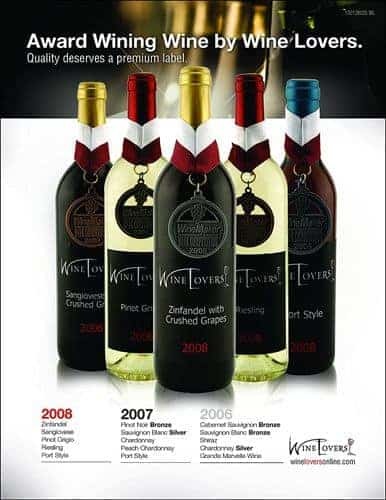 Price: the kit is not expensive and it can also be a beautiful gift for any enthusiast winemaker. The kit explains how to make wine measuring quantities in weight, so if you decide to start the wine from fruit concentrate or juice, getting the right quantities might be tricky. As we already explained, there are some wine making kits that come with fruit concentrate or juice and designed to make wine in a really short time, skipping some of the traditional winemaking stages. 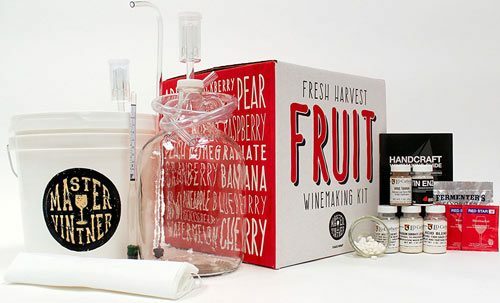 If you don’t feel like beginning to make wine directly from fruit, then this Wine Lovers Wine Making Kit might be more suitable for you. The kit contains 5.2 liters of grape concentrate, a sufficient quantity for the production of 6 gallons or 30 bottles of wine. The concentrate is ready to use and your wine will be ready in only 4 weeks. However, there is to say that this kit only contains the concentrate and you will need all the winemaking equipment that is not included in this package. Step-by-step instructions: the kit comes with a very comprehensive instruction booklet and is really easy to use. Finest quality varietal juice: to make wine, you need must. This kit gives you exactly that, namely over 5 liters of the must of your choice. Multiple choices: if you don’t really like Cabernet Sauvignon, the manufacturer proposes a wide variety of choice. Bottle labels included: once the wine is ready and bottled, you will be able to label the bottles before bragging about them in front of family and friends. While the wine made from this kit is tasty, the description is misleading. The kit comes with juice similar to the varietal proposed, but the exact type of grapes used to make the juice is not mentioned. From all the wine making kits available on the market, we feel that the best are those providing only the brewing equipment and additives. Good wine should always be made from fresh fruit and we are not so fond of the juice or fruit concentrate wine kits. From all the kits we propose, we believe that the best one is the North Mountain Supply 1 Gallon Wine From Fruit Complete 30pc Kit. Except for the bottles, this kit comes with everything needed to make great wine. It also comes with detailed and comprehensive instructions plus a recipe booklet. Another thing we really like is the quality of the additives included. The all-purpose yeast is perfect for both reds and whites and it can even be used for other types of fruit wine. Finally, the kit’s components are of a high quality and will last for a long time without needing replacement. For these reasons, we consider this kit the best wine making kit available on the market! What is a Wine Cooler? – Appliance Or Exquisite Beverage? Waring Pro Wine Chiller: Is It Worth It?